A total of 673 postdoctoral LMU researchers took part in LMU’s Postdoc Survey held in April. In all, 1,200 postdocs had received e-mail invitations to participate in the online exercise. So the overall response rate was an impressive 55%. The data are now being analyzed. The survey was designed to provide a reliable and representative picture of career paths, professional prospects and the level of job satisfaction among postdoctoral early-career researchers at LMU. The data obtained will enable existing support services for early-career researchers to be modified, if necessary, to cater more precisely for current needs. The names of all participants were also entered in a draw for 10 LMU Traveling Fellowships. 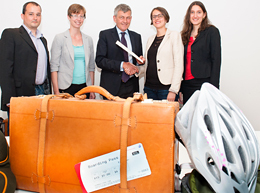 Five of the lucky winners received their prizes from LMU President Professor Bernd Huber personally. The average age of the respondents was 36.5 years – 53% of them men, 47% women. Just over two-thirds of the participants (69.5%) were from Germany, 19.8% came from other member-countries of the EU, while the remaining 10.7% were from other parts of the world. The results of the survey will be published following internal analysis and evaluation of the data.